Among the partners that allow to convert their loyalty points to Alitalia Millemiglia miles, there is Bennet, an Italian hypermarket chain with more that 6o points across northern Italy. It is possible to convert 1 Bennet point to 1 mile, till end of January 2017 (at least). Taken alone, it already seems an interesting possibility to me, considering Carta Bennet Club is activated for free and immediately upon requests, and gives 1 Bennet point for each 0.50 euros spent, after the fist 5 euros. Plus, there are several product that grant additional Bennet points. Paying the bill using a Carta Alitalia Oro adds up more additional miles. For example, let’s consider a total expense cost of 50 euros: Bennet will credit 90 points (50 euros – 5 initial euros) * 2 points each euro, and the Carta Oro will entitle for additional 62 miles, 50 * 1,25 miles multiplier. A grand total of 152 miles, with 50 euros of shopping. Not so bad. In addition, Bennet customer care told me that in the past they were special days when 1 Bennet points gave 2 or event 3 miles. Fingers crossed for a next occasion, but in the meantime I keep earning points. It’s not a secret one of the first tools in the travel hacker toolbox is a credit card to earn loyalty points for each purchase made with it. 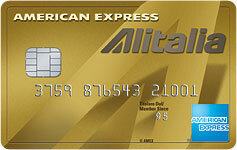 Alitalia has a partnership with American Express to exchange Alitalia miles using AMEX Membership Reward Points. But if you’re not an AMEX customer yet, there are three interesting special cards to consider: Carta Alitalia Verde, Carta Alitalia Oro, Carta Alitalia Platino. The main, common, advantages are earning bonus miles for card activation, plus miles for each purchase made with the card. Amount of the bonus miles and miles multiplier for purchases change with the level of the card. In additions, they offer access to exclusive Alitalia clubs (Ulisse and Freccia Alata), travel assurances, free class upgrades, bonus tickets and more. Conditions and offers change over time, so it’s important to check the current ones. But I’ve discovered an interesting difference when requiring the card online, compared to requiring it offline at the dedicated American Express booths at airports: offline activation enables a way bigger welcome bonus. In fact, requiring a Carta Alitalia Oro at the airport entitles to 25000 miles bonus, instead of the 3000 miles for online activation: 3000 contextual to card activation (as for online), plus additional 22000 miles if at least 500 euros are spent during the first 3 months after card activation. There are two drawbacks, compared to the current online offer (valid till Dec 18th 2016): 60 euros for the card first year fee, while online activation has 0 euros fee for the first year, and no 100 euros Amazon gift card, offered with online activation. All considered, I’ve decided to activate a Carta Alitalia Oro at the airport (Milano Linate, in my case), spending 60 euros to receive those 25000 miles, rather than activating the card online spending 0 euros and receiving a 100 euros Amazon gift card. It seems a loss, but earning these additional 22000 miles would have been more difficult, and expensive, than that. And with 25000 miles is already possible to request a return ticket for a lot of European destinations. To summarize, thanks the card I’ve now: 3000 welcome bonus miles, potential additional 22000 miles if I spent 500 euros during the next 3 months (easy, with my current expenses), free travel assurance, a companion ticket if I spend 15000 euros within the year (but this is too much for me), 3x qualifying miles for Exclusive Clubs access, direct access to Alitalia Club Ulisse, that enables 25% extra miles earning on flights booking, priority boarding, extra baggage free of charge, 2 Economic to Business class updates for European and Mediterranean, paid access to SkyTeam lounges and more, extended to all Skyteam partners. Card is connected to my bank account, no need to open a new one.